What do we mean by the Alps? The European Alps are the mountains stretching from Nice on the Mediterranean coast of France, up in an arc to the Eastern end of Austria at Vienna. Many of the surrounding cities are 1 or 2 hours from the mountains: Munich, Geneva and Venice as examples. Mountain resorts - usually with skiing in the winter - make good bases, such as Chamonix, Zermatt and Cortina. Alpine Exploratory has operated walking holidays in the Alps since 2005. Over the years we have expanded our coverage, since the first trip that we organised which was to the Julian Alps of Slovenia. On this page we set the Alpine scene, thinking back to our first Alpine visits even longer ago. Alpine winter and summer seasons are so contrasting that it's hard to imagine the seasons turning again; but they will do so every Spring and Autumn without fail. Life in the Alps, as in any mountain region, is led according to the rules and whims of nature. Our Summer season is necessarily short, therefore. Our longest season is on the relatively forgiving terrain of the Tour du Mont Blanc, typically from the start of July to the middle of September. Higher, tougher treks like the Walker's Haute Route demand a mid-July start to lessen the risk of early-Summer snows. What is a typical day in the Alps? Let's say we're staying at a hotel in Austria. Our aim is a hut where we'll be staying the night. Breakfast in the hotel will probably be fabulous: some form of eggs and meat, salad, cereals and breads. Coffee is either brought to your table or on tap at a machine. We check out (Alpine Exploratory has paid) and set off. If the day ends at another village then we might walk uphill to a col all morning.. perhaps from 1,000m to 2,000m.. and down to the village in the afternoon. If staying at a hut then we'll stay higher in the mountains. The routecards and maps that we supply show where to walk and describe the difficulties of sections. There can be rocky steps and ridges, drops to the side - it depends on the route. None of our routes involve any climbing or via ferrata being entirely walking routes. We get to the hut perhaps mid-afternoon and announce ourselves to the warden. We're pointed to our dormitory or room - some huts have private rooms - and take a shower if the hut has them. Most do. There's time to relax and see the views before dinner, typically served as a set menu at communal tables. It's a companionable way to travel and you never know what trekking tales you'll hear. Then it's further drinks but perhaps the day's exertion will surprise us: to bed for what can be a very solid sleep! The continent of Europe is hot and dry during Summer, much as it's cold and dry during Winter. Rain tends to come in big bursts: a feature of the Alps that differs from the English Lake District or Scottish Highlands is the higher risk of afternoon thunderstorms. Nevertheless a normal day starts warm and becomes hot, followed by a cooler evening if up high; trekkers might be in shorts and sleeves, then in the evening putting on a fleece and jacket to sit outside the hut. In temperatures we might see 20-25 degrees C in the valley and correspondingly lower, 10-15 degrees, on the cols. Generally just one or two warm layers are needed to trek with, plus base layer and waterproofs. We advise on kit in your info pack, before your trip. Days can be steadily wet, too, and it is essential to trek with good waterproof jacket and trousers. Both are needed, because trousers quickly wet through and might not get the chance to dry. What might a seasoned walker in other parts of the world find different when going to the Alps? Winter and indeed Spring snows fall in a reasonably regular pattern but only to an accuracy of a few weeks! It is never known beforehand at what point the walking passes will be clear of snow. If we reckon on late June or early July on a certain route, then it could be as early as the start of June or as late as mid-July. The depth of the Winter, and Spring snows in May, and the heat of Spring, all combine to the result. In fact warm rain during May and June is the best way to clear the snow: think of running a warm tap on an ice cube! When looking at Alpine Exploratory's season dates, our start dates are set conservatively to avoid the snow lingering on the cols. As we approach the season we'll advise if there is more than usual and any precautions this might mean. In one or two years on the Tour du Mont Blanc, for example, we have recommended micro-spikes (mini-crampons) and trekking poles in early July, but this is rare. While all trekkers should equip themselves as they judge the conditions, an ice axe and crampons are not part of the expected kit for any of our treks. Steeper and craggier mountains combined with extremes of cold and heat through the year, give the conditions for rockfall in the Alps. Paths that run across the hillside are susceptible to minor rockfall, for example in gullies (small valleys across the hillside, cut by streams). Paths tend to re-form on popular routes, but there is always the risk of a slip or of futher falls from above. One very visible rockfall occured in Spring 1991 on the Western side of the Mattertal, the Swiss valley at whose head sits Zermatt. The walking route through the valley passes directly under its foot, near the village of Randa. The Chamonix to Zermatt Walkers' Haute Route can be taken this way: our route skirts the fan of boulders that resulted. 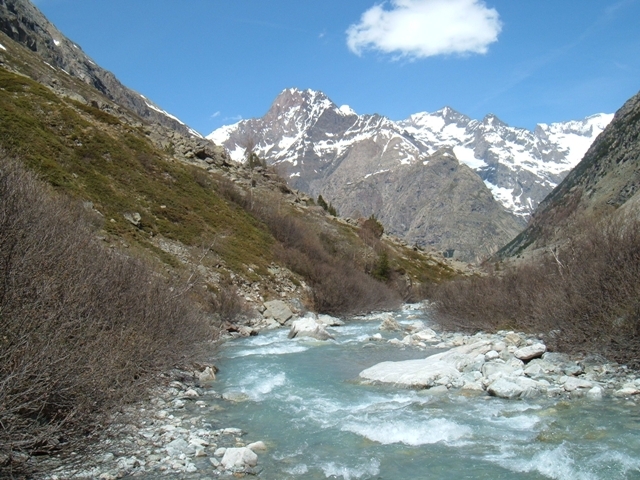 River crossings are not normally a feature of our routes in the Alps, but one thing the early-Summer trekker often sees is the power of water! Snow melts from the mountains and channels itself through the streams, often greatly increasing the flow. In some parts, such as the Haute Savoie in France, bridges across rivers are deliberately taken out until the height of water has passed, to avoid the bridges being washed away - they are then reinstated for the Summer season. In the villages, deep channels lined by boulders are common in order to handle the annual flow. As a team we love staying in hotels and we make it our business - of course - to be discerning. In Austria and parts of Switzerland especially, but also in our other countries, standards are really very high. If you have examples of places that you've enjoyed, please feel able to ask us as you book and we'll do our best to fine tune your trip. Star ratings apply more to some countries than others - we find that many hotels that our clients enjoy the most fall into the 3-star category where one is given, being excellent examples in this range. (In Austria, the equivalent tends to be 4-star but the type of hotel is the same.) In Cortina and Chamonix we know superb, characterful hotels at 2-star which our clients love. We like to keep a watch and we can book higher-rated hotels in many villages. We call a simple hotel, perhaps with dorms, an auberge: at the simplest end it can be a hut-like establishment that is in the valley as opposed to up the hill, or in other words a hostel. At the other end and just below what we'd call a hotel, our auberges have almost all the conveniences. an auberge typically serves dinner to all guests, like a hut. Some of our treks like the Tour du Mont Blanc involve one or two nights in auberges, and the exact arrangements (dorms or private rooms, ensuite or shared bathrooms) depend on availability and your preferences, so we confirm these when we give you your schedule to check. As above, a hut is a real part of the Alpine experience. The feeling can be quite special, akin to cmaping in that it's an extra-ordinary place to sleep, but with the added charms of mountain life: perhaps unusual sounds and smells, cute wood-pannelled rooms or dorms, meals at long tables and drinks ordered from the bar. It's a gentle way of life, in fact, and this is what can take a night or two to settle into. The warden and his or her staff might spend 3 months up at the hut. Their daily pattern is disctated by the remoteness of the hut: does it have a road, or is it reliant on helicoptered or carried-in supplies? Is there running water and mains electricity (or a generator)? Is there cell/mobile signal or do they rely on a satellite connection? Thankfully for comfort, at least, most huts enjoy the more favourable of each of these distinctions! Our trek across the Tyrol can form part of a superb Vienna-to-Zurich tour. Switzerland from East to West; in fact most Swiss cities are good for the start or the end. Innsbruck (or Munich) to Venice incorporating the AV1 is a fabulous crossing of the Alps. Slovenia is reachable from nearly Italian or Austrian cities, as alternatives to Ljubljana. Geneva is linked so easily to the TMB. Italy and the Swiss cities are easily reached. All Swiss airports work well, plus we are well-linked to Italy thanks to the Brig-Milan line. Transport flows South from Munich; with longer transfers anywhere in Austria is possible. Reaching the Alps is quick from the UK. A typical start-town is 1, 2 or 3 hours from the nearest major airport. For example, Chamonix is 1h 30m from Geneva airport by minibus, and Innsbruck is 2h 30m from Munich airport by train. On the same principle, from outside Europe once at an airport, the transfer to the Alps can usually be made right after your flight. If you fancy a break in one of the cities, please see our section below! Booking from overseas - it's easy! The Alps are surrounded by fabulous European cities. As we have traveled, so we have come to know them rather well. We love Vienna, Munich, Venice, Turin, Zurich and more. If your plans allow longer in Europe, please let us give you our pointers. Your info pack contains notes about the cities near your trek. If you're traveling onwards in Europe, please ask us about trains. Our clients from the US and Australia are often trekking as part of a longer trip. Our Tour du Mont Blanc is easy to recommend to strong walkers as a first trek in the Alps. In 11 stages it makes a circuit of Mont Blanc, running between 900m and around 2,600m in altitude. The average stage is 16km with 1,000m of ascent and descent. Alpine Exploratory offers shorter treks, and easier ones, for more of an introduction. We like 3 or 4 days as a length, because it's enough time to get into the swing of it but not too much as to be daunting. Even on our harder treks, such as the Walker's Haute Route or the Alta Via 1 in the Dolomites, we organise part-trips in one week or less. Joining one of our guided trips is a good way to try the Alps, or see a new part of it. Our leaders show the way, while the organisational elements are the same as our other trips. Please look at our holiday pages for more details; the pattern of life varies from route to route and we try to give a flavour. Please email or call us any time for more information. Thank you. See you in the Alps!